Visit Alyson Beecher on Wednesdays for Non-Fiction Picture Books at Kidlit Frenzy. Thanks to her hosting and sharing and those who add their posts discover and celebrate terrific nonfiction picture books! I always learn from these books, am happy that they are more and more available today for children, really for everyone. History is made of stories, and sometimes that history is personal, often told instead of printed. 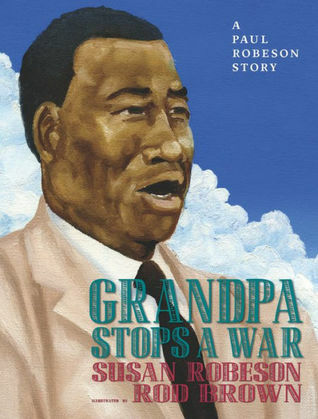 That is where this book about a part of Paul Robeson's life lies, in history passed on. This time, the author, Susan Robeson, his granddaughter, grew up hearing about the wonderful man her grandfather was. She certainly knew he was a great singer, learned early how the spirituals that made him famous came from his own father, an escaped slave. But the story that intrigued her was that he, one day, stopped a war. In the late 1930s, Paul Robeson was living in London when war broke out in Spain. He was concerned and gave concerts with the proceeds going to help the victims of the war, especially the children who had lost their homes, were in dire need of food. It kept on, he kept singing, yet it didn't seem enough. He insisted he must go to Spain, to the front. Many thought it too dangerous, but he did go, and his wife with him. He went to the front and sang. On that day, no guns fired, no bombs dropped. He had stopped a war. Sadly, those who were fighting for Spain eventually lost to the general who was siding with Hitler. Museum-like paintings by Rod Brown show this man who seemed larger than life, the scenes, too, enlarge the story with many details. 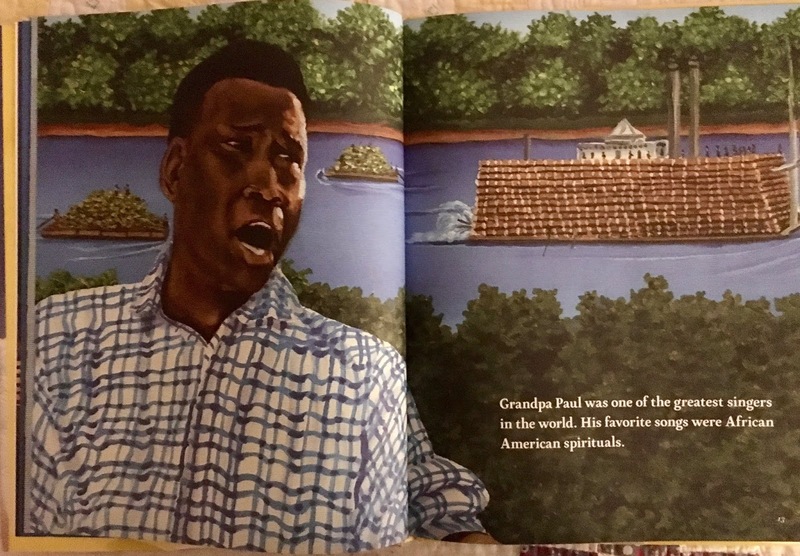 There are the slaves of Robeson's father's time, the spread showing Robeson singing by a river with a riverboat floating by (his most famous song was "Old Man River), and the details of the Valencia oranges looking like "little suns" by the road to the front. There is additional information at the back, including a sad part of Robeson being caught up in that terrible time of McCarthyism where he endured being blacklisted. He was finally exonerated after eight years! 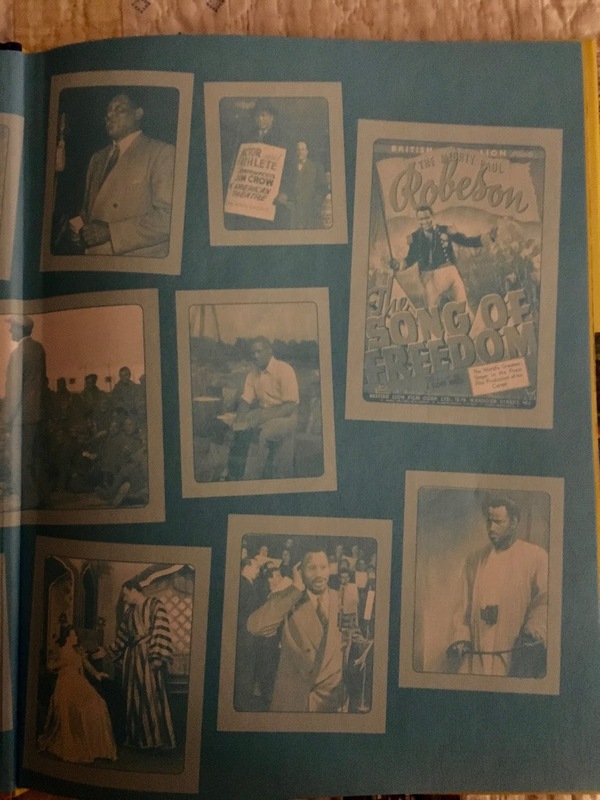 There are also photos of the Robeson family. 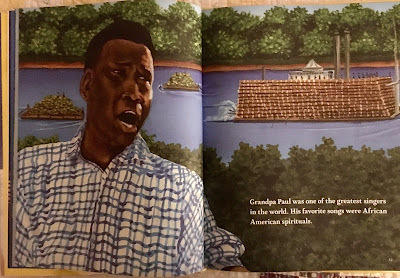 If I shared this with a class, I think I would find some of Robeson's music to share, too. And I would use it as a mentor text to suggest a search for personal family stories to write and share. It is a special story, one that would not be known without a granddaughter who wanted to tell it. I wonder if you readers have stories to share? 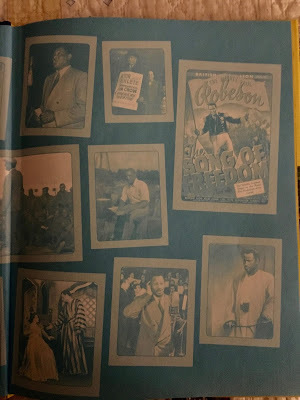 Finally, although the photo doesn't show exactly the color of them, which is in blues, it is great to see numerous photos of Paul Robeson during his life. 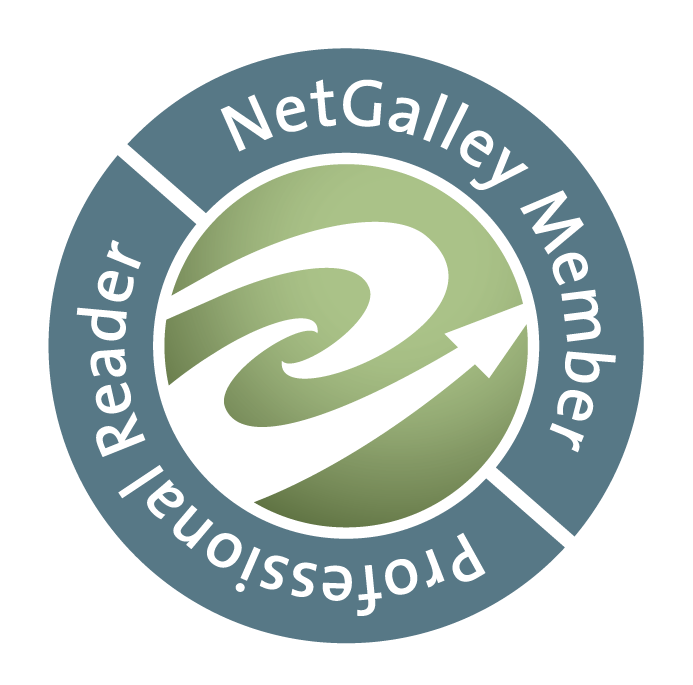 Share book reviews and ratings with Linda , and even join a book club on Goodreads. different hosting each week - Wonderful sharing of all things poetry! Much fun to visit Jen, Kellee & Ricki for lots of book ideas! It's A Giveaway, It's a Pop-Up, It's Shakespeare! 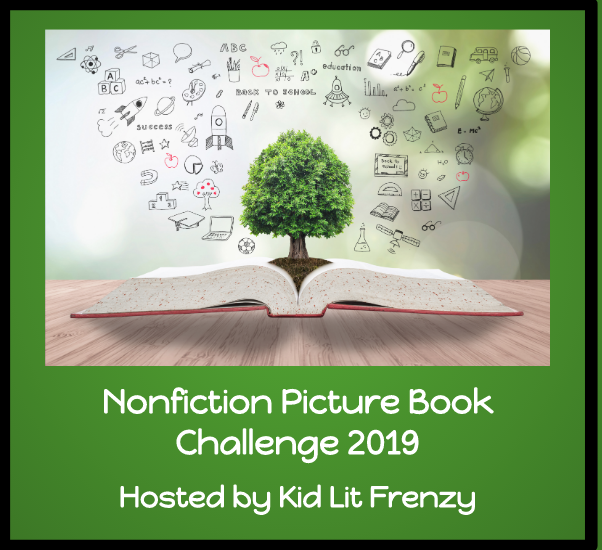 Non-Fiction Picture Books Help Us Know! 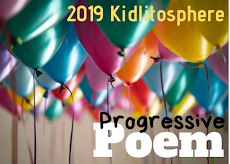 Here is Renee La Tulippe's overview of Poetry Friday! This work by http://www.teacherdance.blogspot.com/ is licensed under a Creative Commons Attribution-ShareAlike 3.0 Unported License.